Mount John rises steeply from the turquoise waters of Lake Tekapo. The strong and the fit can make their way up a steep path to reach the windswept, rocky summit. The less energetic can drive up a smooth, curving, tar-sealed road. From up on Mount John the view is breathtaking. It’s a landscape solely of earth and sky. It is an earth of shadows, light, folds, seams, sharply contrasting colours, rivers, lakes, stands of trees, rocky outcrops, hills, cliffs and mountains. There are ribbons of road, threads of power lines and the thin filigree of a ski lift. The sky is a light, clear, infinite blue dome hung with great, thick luminous clouds and there’s something about it that reduces you to silent, motionless specks. There is more to Mount John than the view however. Firstly it is the site of the University of Canterbury’s Observatory and home to a team of astronomers who man the collection of telescopes which keep constant watch over our skies. Star of the fleet, so to speak, is MOA, a machine of unbelievable power and size. Every night they click away relaying the state of the firmament. 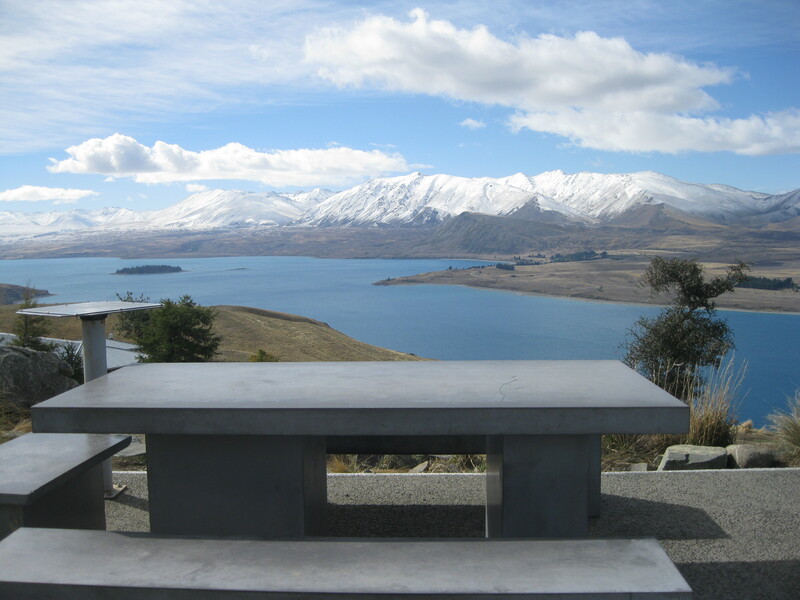 Mount John Observatory offers fascinating tours – called Earth and Sky which explain the work of astronomers, the workings of the telescopes and best of all allow a look, through a telescope, at the earth and the sky. Fascinating by day, magical by night! 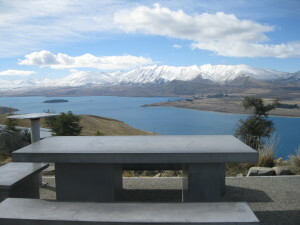 Secondly, Mount John boasts, according to Lonely Planet, the best place on the planet- the Astro Cafe. The food here, and the coffee too, are excellent, but really, it’s mostly a question of location, location, location! Surrounded by mountains, centred on a beautiful blue lake, shrouded by snow in the winter, bathed in warm sunshine in the summer and canopied by 4,367 square kilometre of pristine, Gold Status World Heritage Dark Sky Reserve, Tekapo in the South Island of Aotearoa New Zealand is one of the world’s most beautiful adventure playgrounds. But adventure isn’t all that Tekapo has to offer. 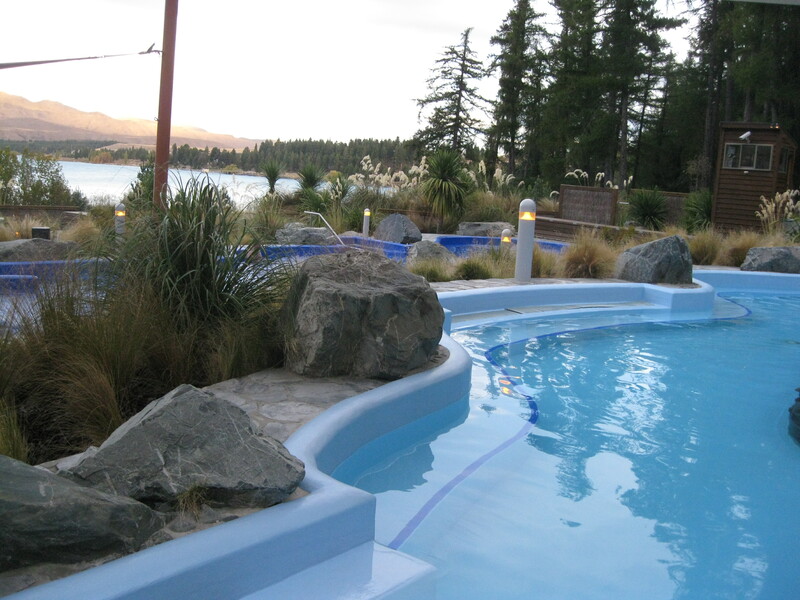 When you’ve done with the day’s adventures and when you’re in need of some rest and relaxation, head to Tekapo’s marvellous hot pools. Spread under that famous heritage sky, tucked into the side of a hill overlooking the lake, the three pools progress from nicely tepid, through deliciously warm and finally to fabulously hot. Work your way up and down the temperatures until, like baby bear, you find the one that’s just right for you, then contemplate the heavens until hunger or fatigue drives you out, or until your skin can stand no more. For those who do want more, there’s the spa with its range of ministrations with soothing oils and lotions. Or, if it’s food you’re after, there’s a great cafe with a stunning lake view, a roaring fire in a two way stone fireplace and great, fresh Kiwi fare. If, (hard to credit but possible) you emerge from your soak energised and ready for action, put on your skates and take a turn around the ice rink just next door.